The nature of my business requires me to carry things with me every day. Laptops, papers, writing instruments, folders, cables, portable batteries, and on and on. So having a bag that is utilitarian is important. And it wouldn’t hurt to have a bag that looks good too. 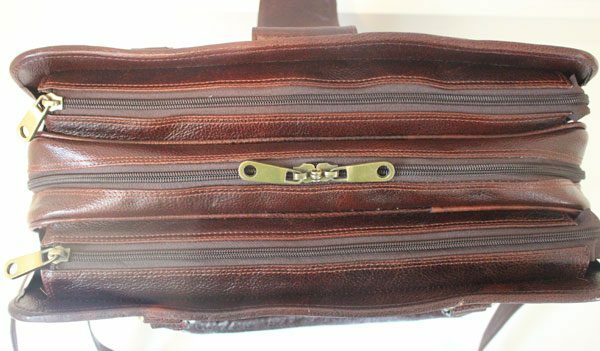 I have always been partial to leather bags because of the look, feel, and aroma. So when I saw the Leacarve leather briefcase I was excited to try it out. Would it fit the bill in my daily life? Let’s find out. With the Leacarve leather briefcase, I have found my daily-carry bag. No matter where I am going, or what I am wearing, the bag looks great. The function is exceptional. With 3 large compartments I can load it up with lots of items and segregate them as needed. Each compartment expands to enable you to store a bunch of stuff, or collapse them to make the bag appear slender if you aren’t carrying alot. There are regular and zippered pockets inside that can hold the little things that you don’t want scattered everywhere, like USB drives, post-it pads, keys, paperclips, pens, and so forth. I hate it when those things roll around the bottom of the bag and make it a hassle to fish them out. So keeping everything secure is always a plus. 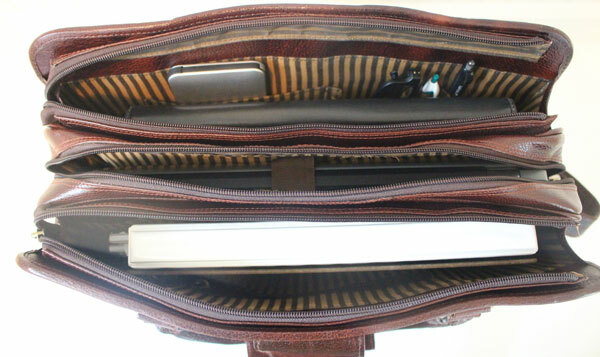 The center compartment is where your laptop goes, with a vertical padded divider with a Velcro closure. The bottom of the bag doesn’t have a padded layer, so I wouldn’t just drop the laptop in there and let it hit the bottom of the bag, so be careful about that. 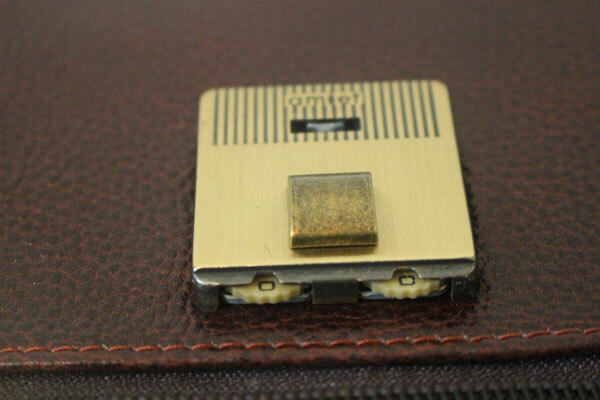 The center compartment also has the ability to use a small padlock to secure the 2 zippers when you zip that compartment closed. That won’t prevent someone from just walking off with the bag, but it would be at least a simple deterrent to someone grabbing your laptop and walking off. 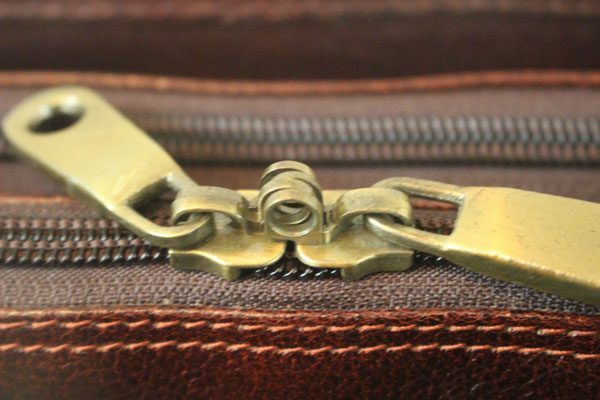 There are brass feet on the bottom that enable the bag to stand on its own, and brass fittings all around from the zippers to the loops that connect the shoulder strap. 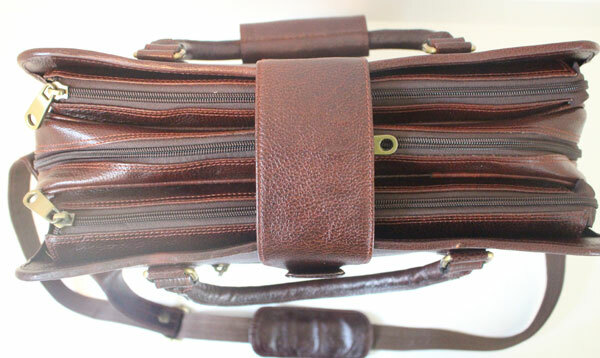 The handle on the top of the bag snaps close and it is soft and supple so it’s a joy to carry. The outside zippered pocket is also very handy for storing the things you might need when traveling and don’t want to have buried in the bag. Things like your wallet, passport, boarding pass, and so forth. 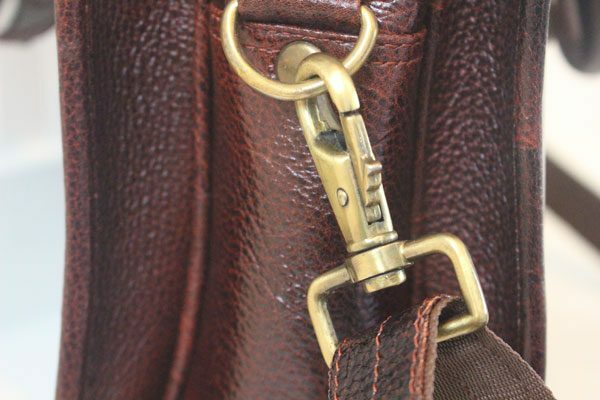 Finally, there is a wide leather strap that is attached to one side of the bag and folds over the top of the bag to connect to the lock that sits just above the zippered pocket. It’s a Swiss combination lock that has 2 small wheels with numbers on them that rotate. You can close the lock without having the numbers set to your combination but you can’t open it without having the numbers set properly. Again, this won’t prevent someone from walking off with the bag, but it does provide at least a simple level of protection from someone rummaging through the bag without your approval. I will also mention that the numbers are so small that I couldn’t see them without my reading glasses. The hazards of getting old I suppose. 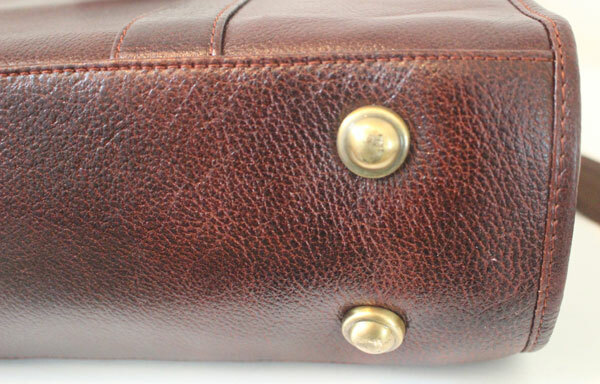 The quality of the leather and workmanship is top notch. The seams appear to be quality and I imagine this bag lasting for years. I wish there was padding under the laptop compartment to cushion it in the bag. 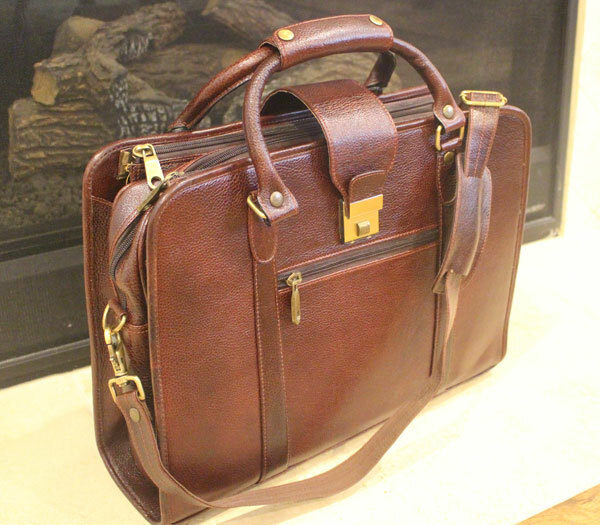 This leather briefcase by Leacarve is the briefcase that I have been looking for. It is big enough to carry everything I need, yet can be small enough to not be bulky. 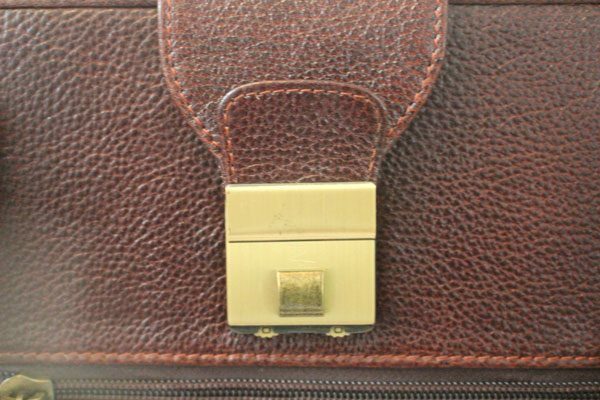 It has a multitude of pockets and compartments to handle all my needs, and I can secure the compartments if I want. The brass feet on the bottom allow the bag to stand on its own, the handle and shoulder strap enable multiple ways to carry the bag, and it smells divine. This bag has the quality and design of a much more expensive bag, so $149 is a great deal. I highly recommend it.